The latest version of Apple’s iOS tablet, the iPad 4 doesn’t go on sale until this Friday the 2nd of November, however it appears that the iPad 4 has already received a Geekbench result, which seems to indicate that the iPad 4 has been clocked at 1.4GHz with a Geekbench score of 1757. 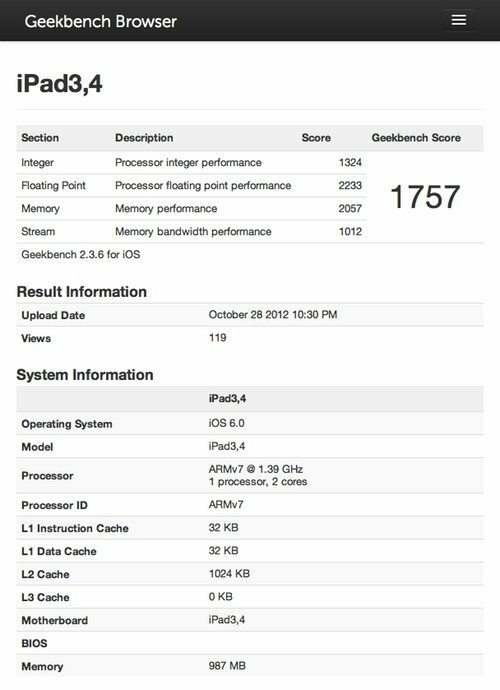 According to a report over on Primate Labs, the Apple iPad 4 benchmark result showed up on the Geekbench Browser on Sunday night, and if real, as there isn’t anything that points towards the result being faked, is hows that the latest iOS slate comes with a dual core processor hitting 1.4GHz. The results also show that the latest iPad offering incorporates 1GB of RAM the same as the current new iPad, the same as the new iPhone 5, whilst doubling the RAM of the Apple iPad 2. To put this into perspective the iPad 4 (4th generation) clocked in at 1.4GHz with a Geekbench score of 1757, the iPhone 5 clocked 1.3GHz at 1571, iPad 3 1.0GHz with a score of 791 and the iPad 2 with 1.0GHz at 780. This means that the iPad 4 is 10 percent faster than the new iOS smartphone, which shouldn’t really surprise as the iPad 4 has the same processor as the iPhone 5 albeit running at a slightly higher frequency, and also means the iPad 4 is twice as speedy as the Apple iPad 2 and the new iPad 3rd generation. Which means of course if you are after an iPad with more performance then the Apple iPad 4 looks like the iOS slate you should opt for. Any of our readers going to be snapping up the iPad 4?